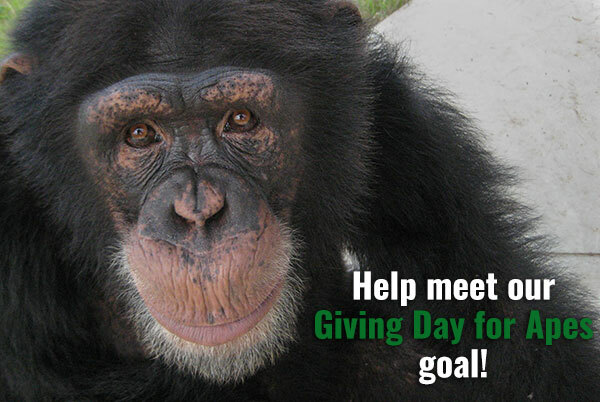 Giving Day for Apes is coming, and we’re asking YOU to make a gift today to support Save the Chimps. Your generous donation will help raise $16,000 to pay for a whole year of care for Arthur! We are making progress towards our goal, but we still have a way to go! 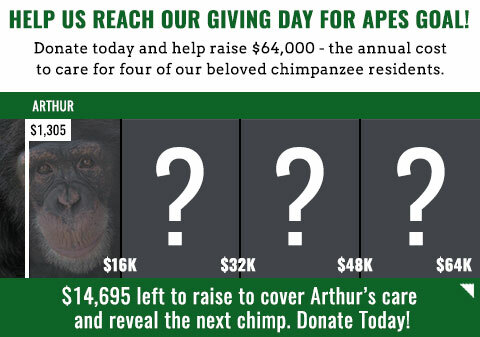 Giving Day for Apes is less than a week away, so now is a great time to help get us to our goal for Arthur. But it gets even better. As part of the Giving Day for Apes event, Save the Chimps can receive additional money and prizes based on the number of gifts we receive, and the total amount we raise. Your gift can go even further! We’ve set the goal for Arthur at $16,000. Before Giving Day for Apes is over, we’re hoping to raise $64,000 – the annual cost to care for four of our beloved chimpanzee residents. But it all starts with you and the support you provide today. When you and other supporters help us reach our first $16,000 goal, we will unlock a special video of another chimpanzee. We hope to share four individual stories featuring the incredible chimpanzees at Save the Chimps, so please help get us there! Giving Day for Apes is September 25 this year, but you don’t have to wait until then. Please make your donation to support Save the Chimps and provide a year’s worth of care for Arthur. Your gift today can help achieve our goal and result in even more money raised for our sanctuary! P.S. Chimpanzees are social animals and so are we. You probably have other chimp lovers in your social network. Why not share this campaign with them and ask them to support Save the Chimps?